← Is “ordinary” kindness becoming a casualty of our technological age? I just love this quote. What makes it special is the hope and encouragement it offers that the ‘ordinary’ lives of most of us, in their own way, hold a good measure of success, which should not be defined in terms of professional or public achievement alone……. Note: I’ve just discovered whilst checking its provenance via Google that this quotation may NOT be from Emerson after all! 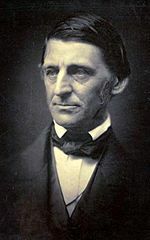 This entry was posted in 01 - new Posts: January 2015 onwards, Favourite Quotes (archive) and tagged 19th Century, Art, Emerson, Google, Literature, Ralph Waldo Emerson, United States, World Literature. Bookmark the permalink. Ah, ha! It’s time to introduce you to the estimable Quote Investigator! I rarely use a quotation any more, especially one that seems to be inspiration and/or all over the internet, without a quick consult on his site. Here’s a link to his research on exactly this quotation. As for success itself, I puzzled over your question. I can’t remember ever thinking much about my own success, except in conversations my dear mother, who desperately wanted me to be (1) rich and (2) well-regarded. That was pretty clearly her definition. I think the quotation you’ve offered is a far better measure of success, whatever its provenance. That’s brilliant, Linda! As a long-time lover of inspiring quotes, I do like to get the provenance right… and I was always suspect in my mother’s eyes: several careers,the fourth one unmentionably disreputable ie as an astrologer,and none of them marriage (until I found a good man with whom to share my life in my mid-thirties, and we became a several-careers household!) – and no interest in money except to cover the basics in life so never likely to be rich. Not good enough, in her eyes! Yes, I like the sentiments expressed in this quotation, probably because it closely reflects my own values.